From time to time some interesting auctions pop up on sites like eBay! We decided to highlight one every month mainly eBay offers some unique pictures of CD-i stuff even we have never seen before! 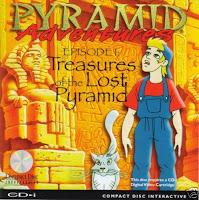 Join in to discover a very nice CD-i game: Pyramid Adventures. It's summer vacation for Dash Daniels... Dash and his cat Mozart visit Egypt with Dash's Aunt Olivia, an archaeologist. Together they discover the Lost Pyramid, whose treasures hold the secrets of a long and happy life. But then, Olivia is captured by the wicked ANTU! And Dash - with your help - must journey through more than 150 Lost Pyramid rooms to find her. So come join the adventure with Dash that is so entertaining! THIS TITLE REQUIRES A "DIGITAL VIDEO CARTRIDGE"! Sold brand new by the gamgator=recommended! Read more about Pyramid Adventures here.